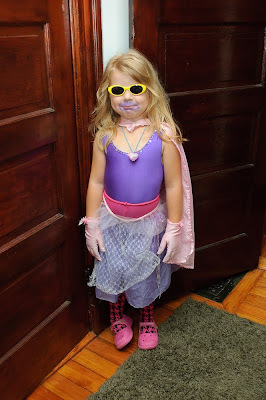 Super Princess keeps appearing out of no where in our home. We're currently investigating her "secret identity"... we'll keep you posted on any leads! The lipstick is my favorite part! Lila is getting so big! 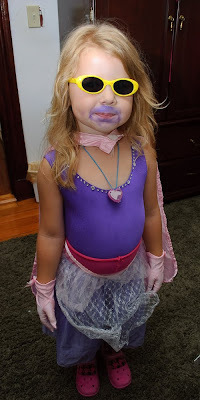 Yeah, the purple mess around the lips has to be my fave part as well...and the yellow shades was a genius move. I love it. You've gotta love that super princess. What a cutie, so creative. Love the lips and socks! cute cute! Does that super princess have any special powers...like cleaning the house, doing laundry or taking care of babies--now that would be nice. Love the purple. Is it lipstick or eyeshadow around her lips?